A classic tale that will captivate lovers of Japan, history, and epic adventure alike. 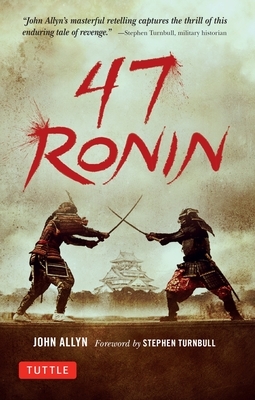 Japan's most celebrated tale of chivalry, loyalty and revenge--and the basis for a Hollywood feature film starring Keanu Reaves--47 Ronin is the epic tale of a heroic band of Samurai warriors who defy the Japanese Emperor to avenge the honor of their fallen master. The story begins in 1701 when the noble Lord Asano attacks an official at court. His punishment is swift and harsh--the Emperor orders Lord Asano to commit ritual suicide (harikiri). His lands are confiscated, his family exiled, and his Samurai warrior brigade is disbanded--becoming Ronin or masterless, wandering renegades. While appearing to follow the Emperor's instructions, the 47 Ronin plot in secret for many years, biding their time until the moment to strike is right. Like the story of the Knights of the Round Table, the Ronin's deeds became legendary, iconic examples of courage, cunning and loyalty in an age when the Samurai were true heroes and honor was something worth dying for. John Allyn's vivid retelling, with a foreword by scholar and film advisor, Stephen Turnbull, presents this epic of Japanese literature in its correct historical context. John Allyn studied Japanese at Stanford University and was stationed in Japan during the early years of the U.S. occupation. After returning to the U.S., he entered UCLA where he received his master's degree in Theater Arts in 1951. He went on to specialize in Japanese theater, receiving a doctorate in Theater History. Stephen Turnbull is the author of over 50 books on the military history of Europe and the Far East. He works as a Japanese cultural consultant and a Lecturer in Japanese Religion at the Department of East Asian Studies at Leeds University. He served as the historical advisor for the Universal Pictures film 47 Ronin starring Keanu Reeves.